For a short winter holiday my wife and I decided to take a trip with the two kids. We have two girls ages two years and 9 months and this was the first trip we have taken since the youngest was born. We ended up taking the trip to Leavenworth during the Martin Luther King holiday weekend for while the Ice Festival was going on. We brought sleds and chains for the car and prepared to be enchanted by the winter wonderland that was awaiting us. This is my second trip to Leavenworth and I must say that both experiences to the quaint little town were enjoyable. Our first trip to Leavenworth was when our oldest was one year old, and it was during the fourth of July for the festival known as Kinderfest. Due to the ban on fireworks in that part of the state during the summer the town of Leavenworth chooses to promote the German holiday of Kinderfest along with the 4th of July. Kinderfest is a holiday that is specifically created to cater to children and so in the spirit of that the town of Leavenworth put up a couple of bouncy houses and and had a local band playing some polka. The kinder fest was fun but fairly underwhelming in comparison to any type of celebration in the greater Seattle area. The point though is not that Kinderfest is the only draw. The point is the town itself with its attempt to recreate a historical Bavarian village to the variety if eateries and activities in the surrounding area.The highlight of this summer trip was inner tubing with our one year old. There is also river rafting an various hikes in the area. Our winter trip was similar to our summer trip. The Ice Festival was fairly underwhelming with a couple of ice sculptures, some fire dancers, a pair of trapeze artists and a frozen muddy hill that a multitude of kids were sledding down. But again, the reason to go was not for the Ice Festival. In the Winter you still have the decent variety of eateries but you also have a variety of winter activities. Just a short drive up the mountain you have ample sledding and skiing at Steven’s Pass. Closer to Leavenworth there are also sleigh rides and snowmobile tours. With the abundant outdoor activities in both the Summer and the Winter and the charm of this mountain town, the various festivals are merely a means to draw you in so that you can discover all that the town has to offer. 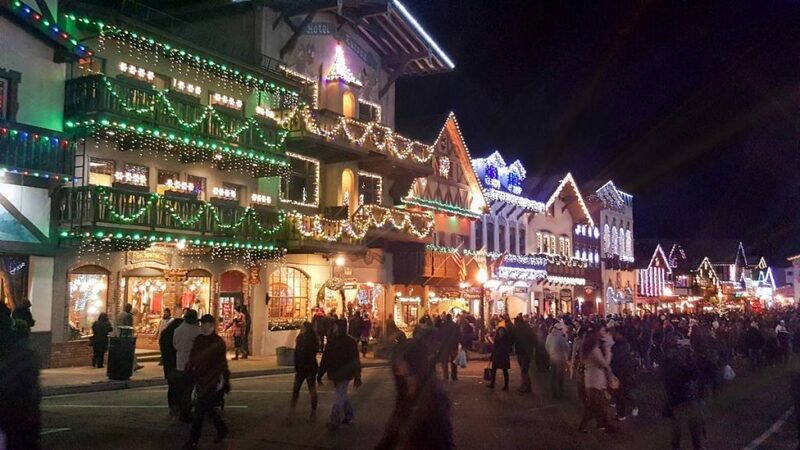 Even though my family and I traveled to Leavenworth at different times of the year, each trip was enjoyable for the food and for the seasonal activities. It is a place that is fun for the whole family and a place that I believe everyone should experience at least once.